Big Hunger reveals the damage caused by (the) hunger-industrial complex, and offers a new vision for the anti-hunger movement to eliminate hunger through a focus on health, economic justice and local economies. Andrew Fisher has worked in the anti-hunger field for twenty-five years, as the executive director of national and local food groups, and as a researcher, organizer, policy advocate, and coalition builder. He has led successful efforts to gain passage of multiple pieces of federal food and nutrition legislation. Fisher is an activist, NGO consultant, and an adjunct teacher at Portland University in Oregon. 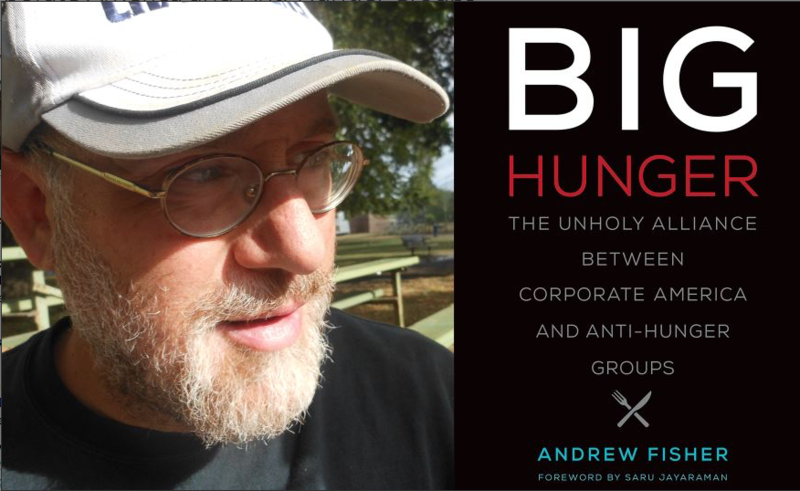 His book, Big Hunger, is the launch for a new vision for how to untangle corporate interests from food banks and the anti-hunger movement. In 1994, Andy Fisher co-founded and led the Community Food Security Coalition (CFSC), a first of its kind national alliance of hundreds of groups working on urban food access and local food. Fisher led CFSC as Executive Director for 15 years, creating and gaining momentum for the concept of community food security while building the food movement as a whole. He successfully led advocacy efforts and passage of crucial federal nutrition legislation to address food security, including the establishment of the Community Food Projects and Farm to School grants. Fisher is an expert on a variety of food system topics and tactics, including food policy councils, community food assessments, healthy corner stores, coalition building, and farm to cafeteria programs. The 2016 election reminded us of the depth of economic insecurity across America, and of the political implications that come from ignoring this populist angst. The decline of Rust Belt communities since the 1980s has been paralleled by the rapid growth of food banks. Instead of challenging the government and corporations to provide living wages and good jobs, to support unions and oppose globalization, the anti-hunger movement has instead built alliances with Walmart, Tyson, and Monsanto, among other socially irresponsible companies. Big Hunger reveals the damage caused by this hunger-industrial complex, and offers a new vision for the anti-hunger movement to eliminate hunger through a focus on health, economic justice and local economies. It is working now here. Please check it on your browser and let me know if it’s working (or if it is not working) My apologies for the trouble.